This article is about the history of science in the Islamic civilization between the 8th and 16th centuries. For information on science in the context of Islam, see Islam and science. Science in the medieval Islamic world (also known, less accurately, as Islamic science or Arabic science) was the science developed and practiced in the medieval Islamic world during the Islamic Golden Age under the Abbasid Caliphate (c. 800–1250) and, to a lesser extent, under the Mamluks and Nasrids during the late medieval period. In the 8th century, scholars had translated Indian, Assyrian, Iranian and Greek knowledge into Arabic. These translations became a wellspring for advances by scientists from Muslim-ruled areas during the Middle Ages. Scientists within the Muslim-ruled areas had diverse ethnic backgrounds & included Arabs, Persians, Assyrians, Kurds and Egyptians. They also came from diverse religious backgrounds; most were Muslims, but their ranks also included some Christians, Jews and irreligious. Through the Umayyad and, in particular, the succeeding Abbasid Caliphate's early phase, lies the period of Islamic history known as the Islamic Golden Age. This era can be identified as the years between 692 and 945, and ended when the caliphate was marginalised by local Muslim rulers in Baghdad – its traditional seat of power. 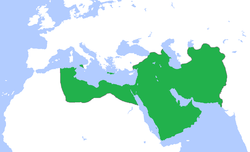 From 945 onward until the sacking of Baghdad by the Mongols in 1258, the Caliph continued on as a figurehead, with power devolving more to local amirs. During the Islamic Golden Age, stable political structures were established and trade flourished. The Chinese were undergoing a revolution in commerce, and the trade routes between the lands of Islam and China boomed both overland and along the coastal routes between the two civilisations. Islamic civilisation continued to be primarily based upon agriculture, but commerce began to play a more important role as the caliphate secured peace within the empire. The wars and cultural divisions that had separated peoples before the Arab conquests gradually gave way to a new civilisation encompassing diverse ethnic and religious backgrounds. This new Islamic civilisation used the Arabic language as transmitters of culture and Arabic increasingly became the language of commerce and government. Over time, the great religious and cultural works of the empire were translated into Arabic, the population increasingly understood Arabic, and they increasingly professed Islam as their religion. The cultural heritages of the area included strong Greek, Indic, Assyrian and Persian influences. The Greek intellectual traditions were recognised, translated and studied broadly. Through this process, the population of the lands of Islam gained access to all the important works of all the cultures of the empire, and a new common civilisation formed in this area of the world, based on the religion of Islam. A new era of high culture and innovation ensued, where these diverse influences were recognised and given their respective places in the social consciousness. The pious scholars of Islam, men and women collectively known as the ulama, were the most influential element of society in the fields of Sharia law, speculative thought and theology. Their pronouncements defined the external practice of Islam, including prayer, as well as the details of the Islamic way of life. They held strong influence over government, and especially the laws of commerce. They were not rulers themselves, but rather keepers and upholders of the rule of law. Conversely, among the religious, there were inheritors of the more charismatic expressions of Christianity and Buddhism, in the Sufi orders. These Muslims had a more informal and varied approach to their religion. Islam also expressed itself in other, more esoteric forms that could have significant influence over public discourse during times of social unrest. Among the more worldly, adab – polite, worldly culture — permeated the lives of the professional, the courtly and genteel classes. Art, literature, poetry, music and even some aspects of religion were among the areas widely appreciated by those of a more refined taste among Muslim and non-Muslim alike. New trends and new topics flowed from the center of the Baghdad courts, to be adopted both quickly and widely across the lands of Islam. Apart from these other traditions stood falsafa; Greek philosophy, inclusive of the sciences as well as the philosophy of the ancients. This science had been widely known across Mesopotamia and Iran since before the advent of Islam. These "sciences" were in many ways contrary to the teachings of Islam and the ways of the adab, but were nonetheless highly regarded in society. The ulama tolerated these outlooks and practices with reservation. Some faylasufs made a good living in the practices of astrology and medicine. Islamic science drew primarily upon Arab, Persian, Indian and Greek learning. The extent of Islamic scientific achievement is not as yet fully understood, but is very large. These achievements encompass a wide range of subject areas, especially mathematics, astronomy, and medicine. Other subjects of scientific inquiry included physics, alchemy and chemistry, cosmology, ophthalmology, geography and cartography, sociology, and psychology. In medieval Islam, the sciences, which included philosophy, were viewed holistically. The individual scientific disciplines were approached in terms of their relationships to each other and the whole, as if they were branches of a tree. 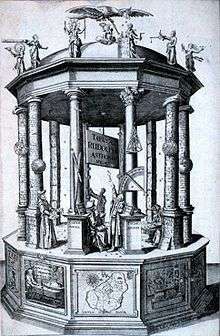 In this regard, the most important scientists of Islamic civilization have been the polymaths, known as hakim or sages. Their role in the transmission of the sciences was central. The hakim was most often a poet and a writer, skilled in the practice of medicine as well as astronomy and mathematics. These multi-talented sages, the central figures in Islamic science, elaborated and personified the unity of the sciences. They orchestrated scientific development through their insights, and excelled in their explorations as well. 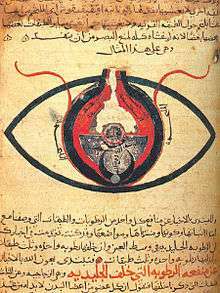 The eye according to Hunain ibn Ishaq. 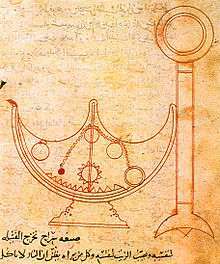 From a manuscript dated circa 1200.
al-Battani (850–922) was an astronomer who accurately determined the length of the solar year. He contributed to numeric tables, such as the Tables of Toledo, used by astronomers to predict the movements of the sun, moon and planets across the sky. Some of Battani's astronomic tables were later used by Copernicus. Battani also developed numeric tables which could be used to find the direction of Mecca from different locations. Knowing the direction of Mecca is important for Muslims, as this is the direction faced during prayer. Ibn Ishaq al-Kindi (801–873) was a philosopher and polymath scientist heavily involved in the translation of Greek classics into Arabic. He worked to reconcile the conflicts between his Islamic faith and his affinity for reason; a conflict that would eventually lead to problems with his rulers. He criticized the basis of alchemy and astrology, and contributed to a wide range of scientific subjects in his writings. He worked on cryptography for the caliphate, and even wrote a piece on the subject of time, space and relative movement. ibn al-Haytham (965–1040), also known as Alhazen, was an Arab scientist born in Basra, Iraq. Later, he moved to Egypt as an adult. Hasan Haytham worked in several fields, but is now known primarily for his achievements in astronomy and optics. He was an experimentalist who questioned the ancient Greek works of Ptolemy and Galen. At times, al-Haytham suggested Ptolomey's celestial model, and Galen's explanation of vision, had problems. The prevailing opinion of the time, Galen's opinion, was that vision involved emission of rays from the eye, an explanation al-Haytham cast doubt upon. He also studied the effects of light refraction, and suggested the mathematics of reflection and refraction needed to be consistent with the anatomy of the eye. He played an important role in the development of optics, experimental physics, theoretical physics, and the scientific method. ibn al-Nafis (1213–1288) was a physician who was born in Damascus and practiced medicine as head physician at the al-Mansuri hospital in Cairo. He wrote an influential book on medicine, believed to have replaced ibn-Sina's Canon in the Islamic world – if not Europe. He wrote important commentaries on Galen and ibn-Sina's works. One of these commentaries was discovered in 1924, and yielded a description of pulmonary transit, the circulation of blood from the right to left ventricles of the heart through the lungs. al-Zarqali (1028–1087) was an Andalusian artisan, skilled in working sheet metal, who became a famous maker of astronomical equipment, an astronomer, and a mathematician. He developed a new design for a highly accurate astrolabe which was used for centuries afterwards. He constructed a famous water clock that attracted much attention in Toledo for centuries. He discovered that the Sun's apogee moves slowly relative to the fixed stars, and obtained a very good estimate for its rate of change. Abbas ibn Firnas (810–887) was an Andalusian scientist, musician and inventor. He developed a clear glass used in drinking vessels, and lenses used for magnification and the improvement of vision. He had a room in his house where the sky was simulated, including the motion of planets, stars and weather complete with clouds, thunder and lightning. He is most well known for reportedly surviving an attempt at controlled flight. al-Zahrawi (936–1013) was an Andalusian surgeon who is known as the greatest surgeon of medieval Islam. His most important surviving work is referred to as al-Tasrif (Medical Knowledge). It is a 30 volume set discussing medical symptoms, treatments, and mostly pharmacology, but it is the last volume of the set which has attracted the most attention over time. This last volume is a surgical manual describing surgical instruments, supplies and procedures. Scholars studying this manual are discovering references to procedures previously believed to belong to more modern times. al-Idrisi (1100–1166) was a Moroccan traveler from Ceuta, cartographer and geographer famous for a map of the world he created for Roger, the Norman King of Sicily. al-Idrisi also wrote the Book of Roger, a geographic study of the peoples, climates, resources and industries of all the world known at that time. In it, he incidentally relates the tale of a Moroccan ship blown west in the Atlantic, and returning with tales of faraway lands. al-Khwarizmi (ca. 8th–9th centuries) was a Persian mathematician, geographer and astronomer. He is regarded as the greatest mathematician of Islamic civilization. He was instrumental in the adoption of the Indian numbering system, later known as Arabic numerals. He developed algebra, which also had Indian antecedents, by introducing methods of simplifying the equations. He used Euclidean geometry in his proofs. al-Razi (ca. 854–925/935) was a Persian born in Rey, Iran. He was a polymath who wrote on a variety of topics, but his most important works were in the field of medicine. He identified smallpox and measles, and recognized fever was part of the body's defenses. He wrote a 23-volume compendium of Chinese, Indian, Persian, Syriac and Greek medicine. al-Razi questioned some aspects of the classical Greek medical theory of how the four humors regulate life processes. He challenged Galen's work on several fronts, including the treatment of bloodletting. His trial of bloodletting showed it was effective; a result we now know to be erroneous. al-Farabi (ca. 870–950) was a Persian/Iranian (born in Farab, Iran) rationalist philosopher and mathematician who attempted to describe, geometrically, the repeating patterns popular in Islamic decorative motifs. His book on the subject is titled Spiritual Crafts and Natural Secrets in the Details of Geometrical Figures. Avicenna (ca. 980–1037) was a Persian physician, astronomer, physicist and mathematician from Bukhara, Uzbekistan. In addition to his master work, The Canon of Medicine, he also made important astronomical observations, and discussed a variety of topics including the different forms energy can take, and the properties of light. He contributed to the development of mathematical techniques such as Casting out nines. Omar Khayyam (1048–1131) was a Persian poet and mathematician who calculated the length of the year to within 5 decimal places. He found geometric solutions to all 13 forms of cubic equations. He developed some quadratic equations still in use. He is well known in the West for his poetry (rubaiyat). Nasir al-Din al-Tusi (1201–1274) was a Persian astronomer and mathematician whose life was overshadowed by the Mongol invasions of Genghis Khan and his grandson Helagu. al-Tusi wrote an important revision to Ptolemy's celestial model, among other works. When he became Helagu's astrologer, he was furnished with an impressive observatory and gained access to Chinese techniques and observations. He developed trigonometry to the point it became a separate field, and compiled the most accurate astronomical tables available up to that time. The Banu Musa brothers, Jafar-Muhammad, Ahmad and al-Hasan (ca. early 9th century) were three Persian sons of a colorful astronomer and astrologer. They were scholars close to the court of caliph al-Ma’mun, and contributed greatly to the translation of ancient works into Arabic. They elaborated the mathematics of cones and ellipses, and performed astronomic calculations. Most notably, they contributed to the field of automation with the creations of automated devices such as the ones described in their Book of Ingenious Devices. Jabir ibn Hayyan (ca. 8th – 9th centuries) was a Persian alchemist who used extensive experimentation and produced many works on science and alchemy which have survived to the present day. Jabir described the laboratory techniques and experimental methods of chemistry. He identified many substances including sulfuric and nitric acid. He described processes including sublimation, reduction and distillation. He utilized equipment such as the alembic and the retort. There is considerable uncertainty as to the actual provenance of many works that are ascribed to him. Jamshid al-Kashi (ca. 1380-1429) is credited with several theorems of trigonometry including the Law of Cosines, also known as Al-Kashi's Theorem. Furthermore, he is often credited with the invention of decimal fractions, and a method like Horner's to calculate roots. He calculated π correctly to 17 significant figures. Ibn Sahl (ca. 940–1000) was a Persian physicist and optical engineer who is credited with discovering the law of refraction often referred to as Snell's law. He used the law to produce the first Aspheric lenses that focused light without geometric aberrations. Hunayn ibn Ishaq (809–873) was an Assyrian Nestorian Christian scholar, physician, and scientist. He was one of the most important translators of the ancient Greek works into Arabic. His translations interpreted, corrected and extended the ancient works. Some of his translations of medical works were used in Europe for centuries. He also wrote on medical subjects, particularly on the human eye. His book Ten Treatises on the Eye was influential in the West until the 17th century. Thabit ibn Qurra (835–901) was a Sabian translator and mathematician from Harran, in what is now Turkey. He is known for his translations of Greek mathematics and astronomy, but as was common, he also added his own work to the translations. He is known for having calculated the solution to a chessboard problem involving an exponential series. According to Dallal, science in medieval Islam was "practiced on a scale unprecedented in earlier human history or even contemporary human history". Will Durant, Fielding H. Garrison, Hossein Nasr and Bernard Lewis held that Muslim scientists helped in laying the foundations for an experimental science with their contributions to the scientific method and their empirical, experimental and quantitative approach to scientific inquiry. The history of science in the Islamic world, like all history, is filled with questions of interpretation. 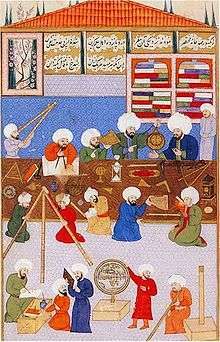 Historians of science generally consider that the study of science in the Islamic world, like all history, must be seen within the particular circumstances of time and place. A. I. Sabra opened a recent overview of Arabic science by noting, "I trust no one would wish to contest the proposition that all of history is local history ... and the history of science is no exception." Some scholars avoid such local historical approaches and seek to identify essential relations between Islam and science that apply at all times and places. The Persian philosopher and historian of science, Seyyed Hossein Nasr saw a more positive connection in "an Islamic science that was spiritual and antisecular" which "point[ed] the way to a new 'Islamic science' that would avoid the dehumanizing and despiritualizing mistakes of Western science." Nasr identified a distinctly Muslim approach to science, flowing from Islamic monotheism and the related theological prohibition against portraying graven images. In science, this is reflected in a philosophical disinterest in describing individual material objects, their properties and characteristics and instead a concern with the ideal, the Platonic form, which exists in matter as an expression of the will of the Creator. Thus one can "see why mathematics was to make such a strong appeal to the Muslim: its abstract nature furnished the bridge that Muslims were seeking between multiplicity and unity." Some historians of science, however, question the value of drawing boundaries that label the sciences, and the scientists who practice them, in specific cultural, civilizational, or linguistic terms. Some scholars consider the practice to be an example of "boosterism" and object that it "defines the achievements of scholars... in terms of their religion rather than their research." Others simply consider it futile. For example, Nasir al-Din Tusi (1201–1274), invented his mathematical theorem, the Tusi Couple, while he was director of Maragheh observatory. Tusi's patron and founder of the observatory was the non-Muslim Mongol conqueror of Baghdad, Hulagu Khan. The Tusi-couple "was first encountered in an Arabic text, written by a man who spoke Persian at home, and used that theorem, like many other astronomers who followed him and were all working in the "Arabic/Islamic" world, in order to reform classical Greek astronomy, and then have his theorem in turn be translated into Byzantine Greek towards the beginning of the 14th century, only to be used later by Copernicus and others in Latin texts of Renaissance Europe." Christians especially Nestorian contributed to the Arab Islamic Civilization during the Ummayads and the Abbasids by translating works of Greek philosophers to Syriac and afterwards to Arabic. They also excelled in philosophy, science (such as Hunayn ibn Ishaq, Qusta ibn Luqa, Masawaiyh, Patriarch Eutychius, Jabril ibn Bukhtishu etc) and theology (such as Tatian, Bar Daisan, Babai the Great, Nestorius, Toma bar Yacoub etc.) and the personal physicians of the Abbasid Caliphs were often Assyrian Christians such as the long serving Bukhtishu dynasty. Thus the founders of grammar were Sibawaih and after him, al-Farisi and Az-Zajjaj. All of them were of Persian descent… they invented rules of (Arabic) grammar … great jurists were Persians … only the Persians engaged in the task of preserving knowledge and writing systematic scholarly works. Thus the truth of the statement of the prophet becomes apparent, 'If learning were suspended in the highest parts of heaven the Persians would attain it' … The intellectual sciences were also the preserve of the Persians, left alone by the Arabs, who did not cultivate them … as was the case with all crafts … This situation continued in the cities as long as the Persians and Persian countries, Iraq, Khorasan and Transoxiana [=modern Central Asia], retained their sedentary culture. — Ibn Khaldun, Muqaddimah, Translated by Franz Rosenthal (III, pp. 311-15, 271-4 [Arabic]; R.N. Frye. p. 91. 1 2 3 Robinson (editor), Francis (1996). The Cambridge Illustrated History of the Islamic World. Cambridge University Press. pp. 228–229. 1 2 Ibn Khaldun, Franz Rosenthal, N. J. Dawood (1967), The Muqaddimah: An Introduction to History, p. 430, Princeton University Press, ISBN 0-691-01754-9. ↑ Joseph A. Schumpeter, Historian of Economics: Selected Papers from the History of Economics Society Conference, 1994, y Laurence S. Moss, Joseph Alois Schumpeter, History of Economics Society. Conference, Published by Routledge, 1996, ISBN 0-415-13353-X, p.64. ↑ A. I. Sabra (1996). "Greek Science in Medieval Islam". In Ragep, F. J.; Ragep, Sally P.; Livesey, Steven John. Tradition, Transmission, Transformation: Proceedings of Two Conferences on Pre-modern Science held at the University of Oklahoma. Brill Publishers. p. 20. ISBN 90-04-09126-2. ↑ Salah Zaimeche (2003), Introduction to Muslim Science. 1 2 Marshall Hodgson, The Venture of Islam; Conscience and History in a World Civilisation Vol 1. The University of Chicago, 1974, pg. 233. ↑ Marshall Hodgson, The Venture of Islam; Conscience and History in a World Civilisation Vol 1. The University of Chicago, 1974, pg. 235. ↑ Marshall Hodgson, The Venture of Islam; Conscience and History in a World Civilisation Vol 1. The University of Chicago, 1974, pg. 236–238. 1 2 Marshall Hodgson, The Venture of Islam; Conscience and History in a World Civilisation Vol 1. The University of Chicago, 1974, pg. 238–239. ↑ Marshall Hodgson, The Venture of Islam; Conscience and History in a World Civilization Vol 1. The University of Chicago, 1974, pg. 238–239. 1 2 Nasr, Seyyed Hossein (1968). Science and Civilization in Islam. Harvard University Press. p. 41. ↑ Linton (2004), p.97). Owing to the unreliability of the data al-Zarqali relied on for this estimate its remarkable accuracy was somewhat fortuitous. ↑ Masood, Ehsan (2009). Science and Islam A History. Icon Books Ltd. pp. 73–75. ↑ Toomer, Gerald (1990). "Al-Khwārizmī, Abu Jaʿfar Muḥammad ibn Mūsā". In Gillispie, Charles Coulston. Dictionary of Scientific Biography. 7. New York: Charles Scribner's Sons. ISBN 0-684-16962-2. ↑ Lindberg, David (1978). Science in the Middle Ages. The University of Chicago Press. p. 23,56. ↑ Selin, Helaine, ed. (1997). Encyclopaedia of the History of Science, Technology, and Medicine in Non-Western Cultures. Kluwer Academic Publishers. pp. 151, 235, 375. ↑ Lagerkvist, Urf (2005). The Enigma of Ferment: from the Philosopher's Stone to the First Biochemical Nobel Prize. World Scientific Publishing. p. 32. ↑ O'Connor, John J.; Robertson, Edmund F., "Ghiyath al-Din Jamshid Mas'ud al-Kashi", MacTutor History of Mathematics archive, University of St Andrews. ↑ K. B. Wolf, "Geometry and dynamics in refracting systems", European Journal of Physics 16, p. 14-20, 1995. ↑ Dallal, Ahmad (2010). Islam, science, and the challenge of history. Yale University Press. p. 12. ISBN 9780300159110. ↑ Saliba, George (Autumn 1999). "Seeking the Origins of Modern Science? Review of Toby E. Huff, The Rise of Early Modern Science: Islam, China and the West". Bulletin of the Royal Institute for Inter-Faith Studies. 1 (2). Retrieved 2008-04-10. ↑ Will Durant (1980). The Age of Faith (The Story of Civilization, Volume 4), p. 162–186. Simon & Schuster. ISBN 0-671-01200-2. ↑ Lewis, Bernard (2001). What Went Wrong? : Western Impact and Middle Eastern Response. Oxford University Press. p. 79. ISBN 0-19-514420-1. ↑ Sabra (2000) p. 216. ↑ Nasr, Seyyed Hossein (1968). "The Principles of Islam". Science and Civilization in Islam. Harvard University Press. ISBN 0-946621-11-X. Retrieved 2008-02-03. ↑ Seyyed Hossein Nasr, Science and Civilization in Islam. ↑ Aaen-Stockdale, C.R. (2008). "Ibn al-Haytham and psychophysics". Perception. 37 (4): 636–638. doi:10.1068/p5940. PMID 18546671. ↑ George Saliba (1999). Whose Science is Arabic Science in Renaissance Europe? Hudson, A. (2003). Equity and Trusts (3rd ed.). London: Cavendish Publishing. ISBN 1-85941-729-9. Huff, Toby E. (2003). "The Rise of Early Modern Science: Islam, China, and the West". Cambridge University Press. ISBN 0-521-52994-8. Masood, Ehsan (2009). Science and Islam A History. Icon Books. Morelon, Régis; Rashed, Roshdi (1996). 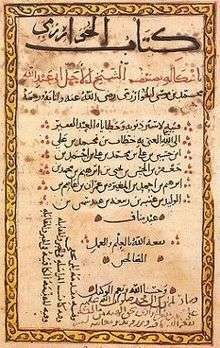 Encyclopedia of the History of Arabic Science. 3. Routledge. ISBN 0-415-12410-7. Phillips, William D.; Carla Rahn Phillips; Jr. Phillips (1992). The Worlds of Christopher Columbus. Cambridge University Press. ISBN 0-521-44652-X. Sabra, A. I. (2000) "Situating Arab Science: Locality versus Essence," Isis, 87(1996):654–70; reprinted in Michael H. Shank, ed., The Scientific Enterprise in Antiquity and the Middle Ages," (Chicago: Univ. of Chicago Pr. ), pp. 215–231. Saliba, George (1994). A History of Arabic Astronomy: Planetary Theories During the Golden Age of Islam. New York University Press. ISBN 0-8147-8023-7. Turner, Howard R. (1997). Science in Medieval Islam: An Illustrated Introduction. University of Texas Press. ISBN 0-292-78149-0. Nader El-Bizri, 'A Philosophical Perspective on Alhazen's Optics', Arabic Sciences and Philosophy (Cambridge University Press), Vol. 15 (2005), pp. 189–218. Nader El-Bizri, 'In Defence of the Sovereignty of Philosophy: al-Baghdadi's Critique of Ibn al-Haytham's Geometrisation of Place', Arabic Sciences and Philosophy (Cambridge University Press), Vol. 17 (2007), pp. 57–80. Huff, Toby E. (2000). "Science and Metaphysics in the Three Religions of the Books" (PDF). Intellectual Discourse. 8 (2): 173–198. Morelon, Régis; Rashed, Roshdi (1996). Encyclopedia of the History of Arabic Science. 2–3. Routledge. ISBN 0-415-02063-8. Nasr, Seyyed Hossein (1976). Islamic Science: An Illustrated Study. Kazi Publications. ISBN 1-56744-312-5. Nasr, Seyyed Hossein (2003). Science & Civilization in Islam (2nd ed.). Islamic Texts Society. ISBN 1-903682-40-1. Deen, S M (2007). Science Under Islam: Rise, Decline, Revival. LULU. ISBN 978-1-84799-942-9. BBC (2010). Science and Islam.